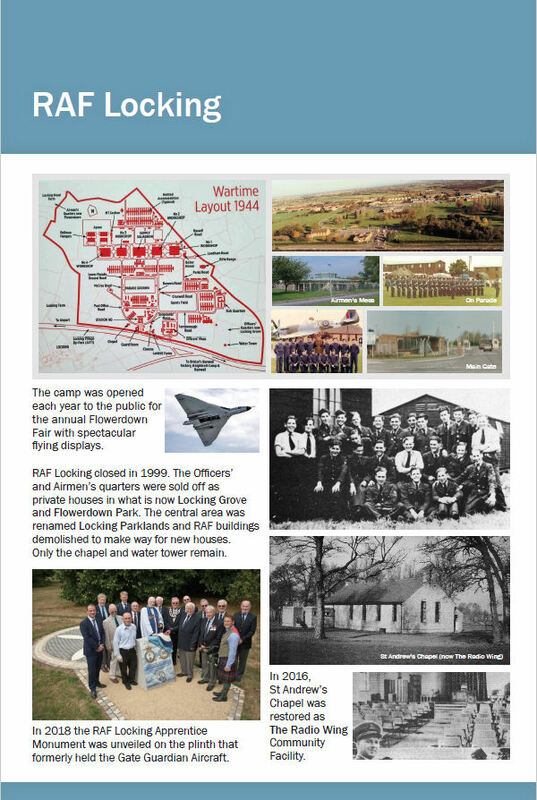 RAF Locking was opened in March 1939 just before the start of WW2 as a training camp providing training in aircraft trades including flight mechanics, airframes, engines, parachute training and air gunnery. There were satellite camps near Banwell at Knightcott, on Summer Lane and at Hill End. During the war RAF Locking became a huge hutted encampment where it was not unusual to have 6,000 personnel on parade at the same time. 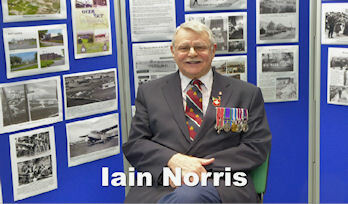 Four years after opening the school had trained 30,682 tradesmen for the RAF and Fleet Air Arm. While many RAF bases closed after WW2, Locking continued to grow. 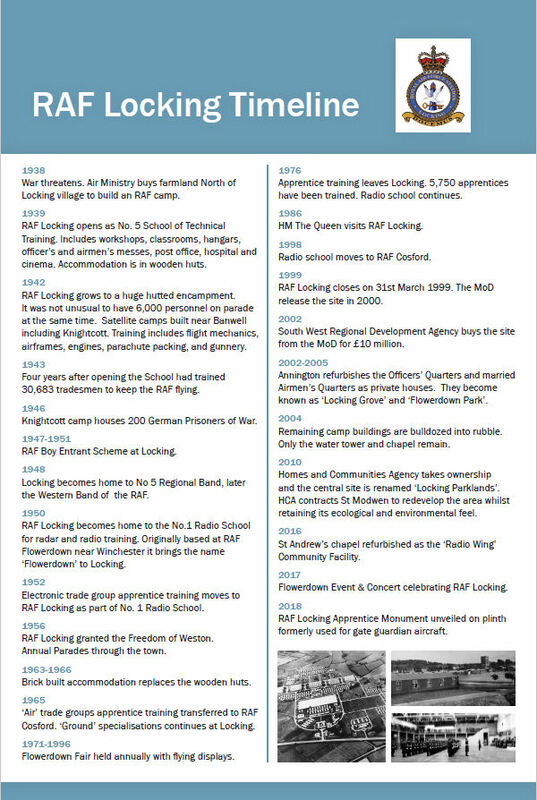 In 1947 the RAF Apprentice Scheme moved to Locking. The apprentice school had originally been based at Flowerdown near Winchester and brought the name with it when it moved. 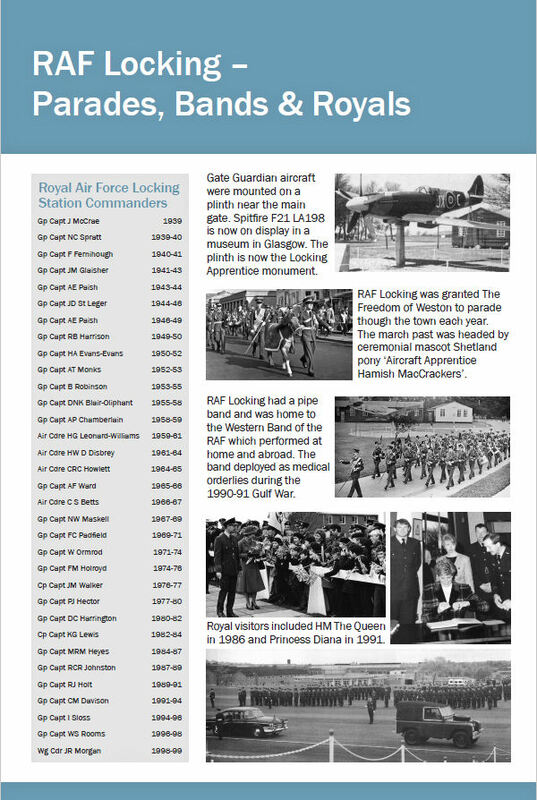 In 1948 Locking became the home of the RAF Regional Band later the Western Band of the RAF. In 1950 the ‘No. 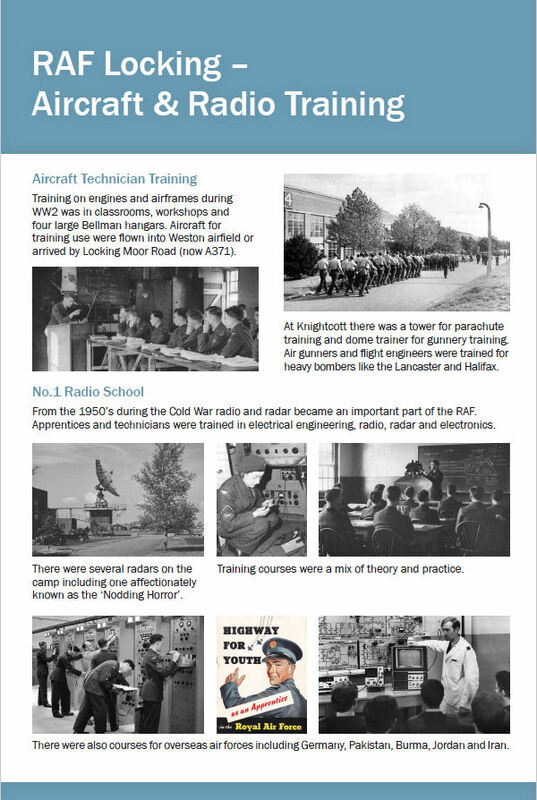 1 Radio School’ moved to Locking to provide training for radio and radar technicians, and as radar became an important part of the RAF the site became a specialist school for electronics. There were also courses for overseas students from several different countries. 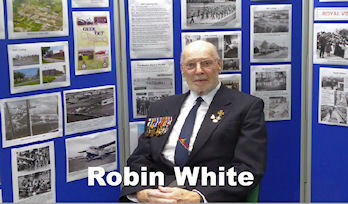 It was never an operational base only a training base, but as well as the gate guardians there were several aircraft frames used for training, and a gliding club and Varsity aircraft based down the road at Weston airfield to provide air experience and navigation training. 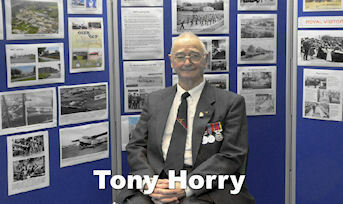 The wooden huts were replaced with brick built accommodation, and there were 4 large Bellman hangars with workshops, an officers mess, sergeants mess, apprentices club, NAAFI shop, school, church, YMCA, post office, barbers, newsagents, cinema, athletics track, sports fields, tennis courts and other facilities. RAF Locking also operated a scheme whereby local women could become WRAF personnel and continue to live at home. Before the current Locking primary school was built children from Locking village in the 1950s and 1960s attended school in one of the huts on the camp, and the local scouts and guides met there. 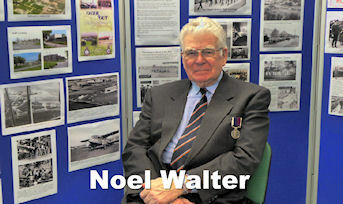 There were children’s parties for the camp and village children, free fireworks displays for the local community and the annual Flowerdown Fair provided spectacular flying displays. There were several visits by royalty including HM The Queen in 1986, and Princess Diana in 1991. The Locking based Western Band gave concerts throughout the UK, Germany, Cyprus and the Middle East and served as medics during the Gulf War. 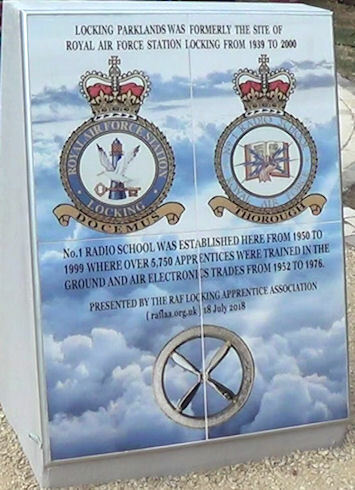 The Radio School moved to RAF Cosford in 1998, and RAF Locking closed on 31st March 1999 sixty years after it had opened. The RAF finally left the site in 2000. It lay dormant until 2002 when it was sold by the MoD for £10 million to the South West Regional Development Agency. In 2002 - 2005 Annington who run MoD housing refurbished the officers quarters and married airmens quarters and sold them off as private houses. They are now known as ‘Locking Grove’ and ‘Flowerdown’. In 2004 the remaining buildings were bulldozed into gigantic piles of rubble; only the water tower and St Andrew’s chapel remain. The chapel was saved from demolition following pressure from Locking Parish Council and local residents. In 2010 the Homes and Community Agency took ownership and the main site was renamed ‘Locking Parklands’. HCA signed an agreement with property developer St. Modwen to redevelop the area whilst retaining the ecological and environmental feel of the site. 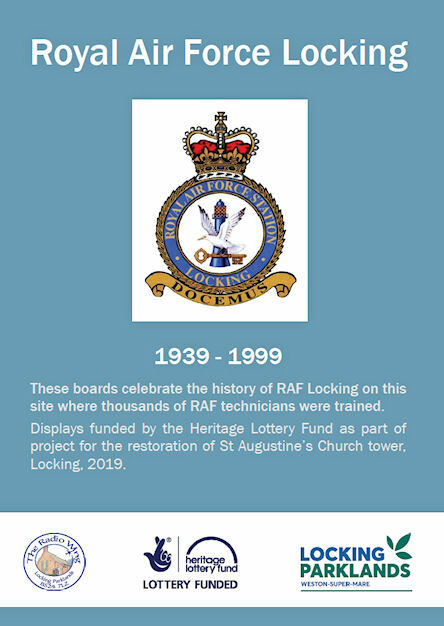 2016 saw the refurbishment of the former chapel as a community facility named ‘The Radio Wing’ in recognition of Locking’s radio school, and in 2017 there was an event celebrating RAF Locking organised by St Augustine’s church and concert on the site by the RAF Association. July 2018 saw the opening of the RAF Apprentice monument on the plinth where gate guardian arcraft were formerly mounted. 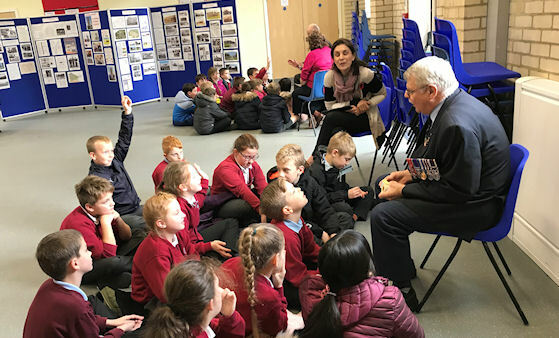 In November 2018 children from Locking Primary School visited the RAF Locking Apprentice Monument and The Radio Wing as part of our Local Heritage Project. 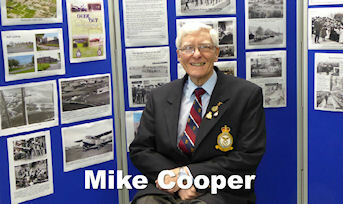 They met with former RAF personnel to learn about the former RAF Locking camp. They filmed video interviews asking questions about life on the camp. 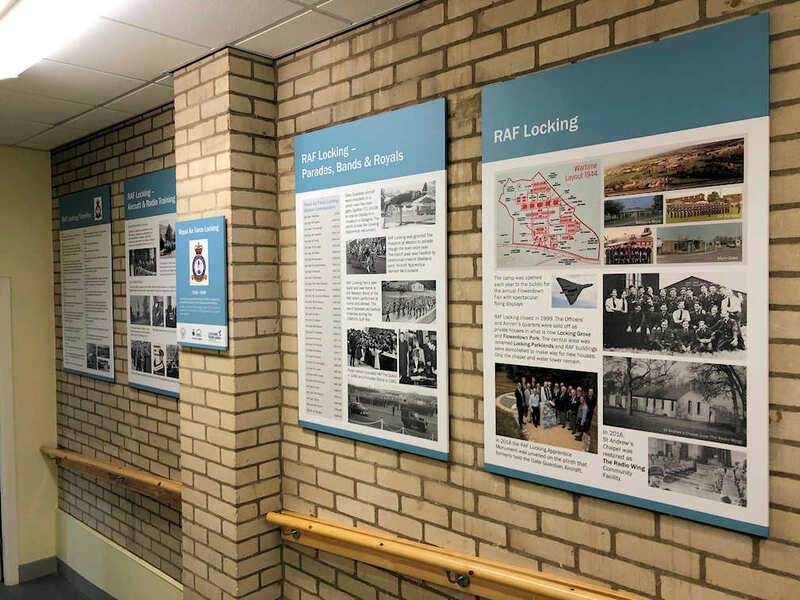 History Boards about RAF Locking have been created as part of the Heritage Project for permanent display on a heritage wall at 'The Radio Wing' Community Facility.